As I said a few weeks ago, I wanted to delve into a more personal side of things here on Whoops It's Hannah, so here's a little life update to let you know how I am and what I'm up to. I'm interspersing this post with some pictures I took of some flowers; I absolutely love photographing flowers (follow my Instagram if you like these - wink!) and I don't normally share those photos here but I hope you like them in this post! I used to work in a chippy, but it wasn't really working for me so I chose to sign up to The Body Shop at Home to become a consultant with them, and I was accepted. So now my job is to go to people's houses, show off Body Shop products, and get people ordering them! I also work on social media as well. If you would like to receive some exclusive offers on The Body Shop products (last month things were 40% off!) then join my Facebook group. I look forward to seeing you there! So now I have a new job which I am very excited about! I am currently studying for an Extended Diploma in Musical Theatre, and I have just officially finished my first year of it! In my first year I earned a Double Distinction, the equivalent to As at AS level! So I am extremely happy with my grades so far and look forward to my second year of this course. If you're unsure about what my course involves, I'm basically assessed in my ability in acting, singing, and dancing, applying techniques and the skills that make you a good performer. There's also a heck of a lot of written coursework, which really wears you out after a long day of rehearsals! My assessments are usually practical, based on my performances in shows. Some of you may know that I joined Slimming World back in March to control my bad eating habits and help me lose five stone. Well, I've just passed the halfway mark, and I'm delighted! I have dropped a dress size, and am on the verge of dropping another, and it feels wonderful to finally have a body I feel confident in and proud of. For too long I let my weight and size make me feel embarassed and insecure, and now that I have taken control over it I am never going to let myself feel that way again. I think that everyone is beautiful no matter what size they are, and other people's health is no concern of mine (if you wouldn't slap a ciggie out of a smoker's hand, you don't get to judge people you decide are too fat or too thin for your liking), but I am so so proud of myself for what I have done for me and my health. So far I've shared some pretty happy things, but not everything going on right now is all great. I have been struggling with my moods a lot for a few years on and off, but now things seem to feel much bigger and much worse. I am constantly swapping from feeling elated and hopeful to miserable and hopeless. I've been on medication now for just over a month, and while it does seem to be helping my moods, it's causing a few physical side effects that are making things a bit tricky. This is the sort of thing I would like to post about openly on here, so expect some more mental health updates in the future. What big things are happening in your life? 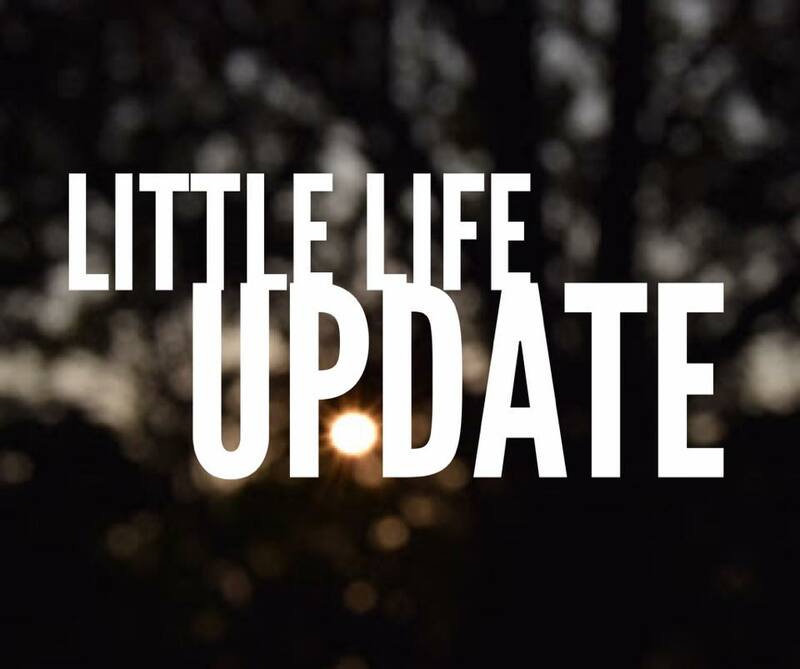 Feel free to leave a comment of your own little life update below!